Franklin Monroe freshman Dyaln Brumbaugh takes a turn at the plate in loss to Miami East. The Jets baseball team had a nail biter going for 5 innings against fellow CCC team Miami East. For a good while it was a 3-2 contest with Miami East holding that 1 run lead. But the Jets faltered in the 6th inning and the Vikings took advantage. They widened their lead and the Jets struggled to generate runs down the stretch. They would finally fall 7-3. Goins was the pitcher of record for the Jets, he would be relieved in the 6th inning by Lawson. Goins had 6 runs scored on him, but only 1 was earned – the Jets would record 5 errors in the loss. Luenuler was the pitcher for the Vikings and he would go the distance for the win. Both teams scored early and it was a 1-1 tie. Franklin Monroe earned their run by playing small ball and working a runner to 3rd base where a bunt brought him across the plate. Miami East tacked on a couple of runs in the 3rd and the Jets responded with a run of their own. The game stayed at a reachable score of 3-2 for several innings as both teams played stingy defense. But in the 6th inning Goin began to run out of gas. The bases were loaded and East was able to get runners around to score with timely hits but also thanks to a couple of errors. Lawson came in with 2 out and although he gave up a run, he was able to get the Jets out of the inning. But by that time the damage had been done. The Jets tried hard to mount a comeback. But Viking pitcher Luenuler was able to get 4 strikeouts in the last 2 innings. In the 6th, the 1st two batters got on base. But the next batter flied out and then the next 2 struck out. Leaving 2 runners stranded at 2nd and 3rd. Luenuler helped himself in the next Miami East at bat when he hit a double and drove in an insurance run. The Jets made their last stand in the 7th inning. They managed to get a couple of runners on base, but there were 2 outs. So the Jets decided to roll the dice. On a well hit ball they sent a base runner around to home where he was just barely thrown out to end the game – it was a close call. But when you are down by 4, it was a gamble worth taking. Coach Tyler Rhodus, “We battled the entire game. We are getting better every game and we talked about that – we played 3 games and we improved each game. We made some changes at the plate and we got more hits today (7). I put that 6th inning on me a little bit, I probably stuck with the starter a little too long. We were hoping to get another inning out of him. Jet Hitting: Ressler 1-3, 2b, 1 stolen; Young 1-3; Sease 3-4, 2b; Hosler 2-4, 1 stolen. 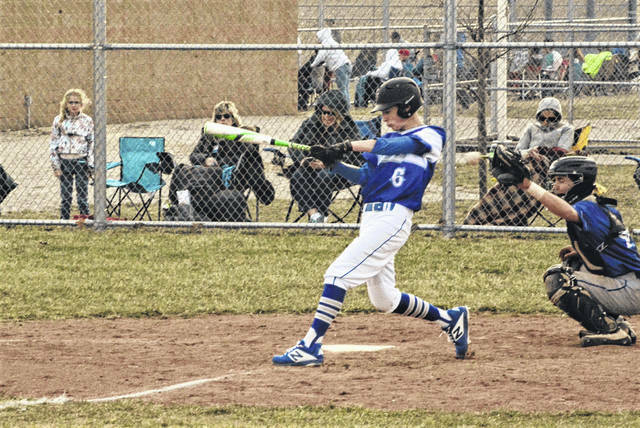 https://www.dailyadvocate.com/wp-content/uploads/sites/34/2019/03/web1_FM-BB-Dylan-Brumbaugh-Tilton.jpgFranklin Monroe freshman Dyaln Brumbaugh takes a turn at the plate in loss to Miami East.